The coastline of Sydney's Royal National Park, the second oldest national park in the world (do not believe some who say it is the oldest, this title belongs to Yellowstone National Park in the USA), is some of the most spectacular coastal scenery I have seen anywhere in the Pacific. The almost 30 kilometres of coast has a collection of cliffs that are not only shear, they are very high. In between these cliffs there are a few beaches, a lagoon or two and a couple of small coves. In some spots, the cliffs drop in height and are more like the cliffs found in the rest of New South Wales. 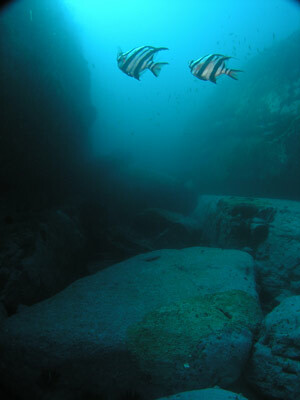 All along Royal National Park there are pristine dive locations, more than a hundred separate dive sites. At the northern end of the park, closer to Port Hacking, there are the popular dive sites of Barrens Hut, The Balcony, The Split and many more. 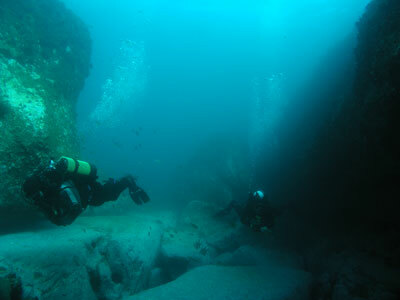 One of the better of the northern sites is known as Underwater Wilderness or The Gullies. This site is located just south of Barrens Hut (exactly 550 metres) at a GPS Reading of 34° 05' 40"S 151° 10' 04"E (using AUS66 as datum - see my GPS Page for details on this). To locate, just go to the above GPS Reading and run in towards the shore until the reef is encountered on your depth sounder. The sand is about 22 metres and the reef goes from this to about 18 metres in a gradual rise before there is a wall that comes up to 14 and then 5 metres. Drop anchor anywhere here (it does not really matter if you are not exactly located at the exact mentioned spot) but not too shallow as in even medium swells the waves can almost break here. I would recommend anchoring on the slope from 18 to 22 metres. The reef consists of low rocks near the sand, with a couple of fingers that extend to the east for a short distance. As you come shallower, there are some large boulders and then, about 20 to 40 metres from the sand (depending on where you are), there is a wall that rises at first to 14 metres or so and then to 5 to 7 metres. Right in close to the rock platform the reef is a kelp covered flatish rock about 5 to 7 metres deep. Near the anchoring spot, the wall that is immediately due west is actually the outer wall of a largish gully. There are also other smaller (narrower and not as deep) gullies, hence its alternate name. The main gully basically run north-south and is about three to five metres wide and four or five metres deep. There are some small caves and swim-throughs in the gullies and a number of cracks/gullies and holes that run out to the outside of the reef. 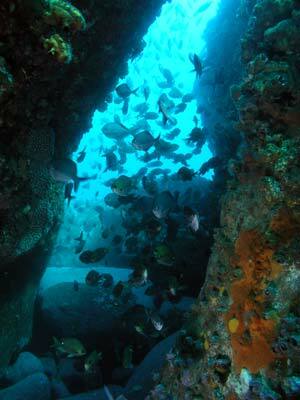 The gullies are very often home to Port Jackson sharks and wobbegongs as well as cuttlefish. From the anchoring spot, I normally head to the east to the sand and follow the two fingers of reef (swimming in between them) till the one on your left ends. Follow this edge and it will bring you back to the main reef edge. 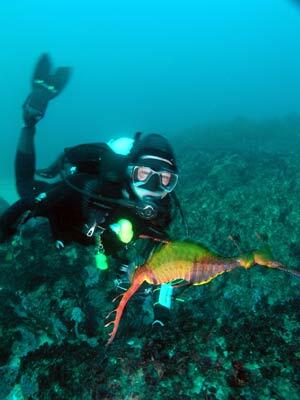 Along this section you will see sea dragons, Port Jackson sharks, red morwong and other species like leatherjackets. 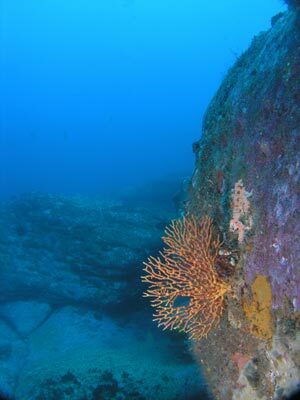 The rocks have lots of growth on them, including a few large and colourful gorgonias and numerous sea squirts. The top of the reef is covered in kelp. The tops of all the rocks near the edge have many different species of nudibranches on them. 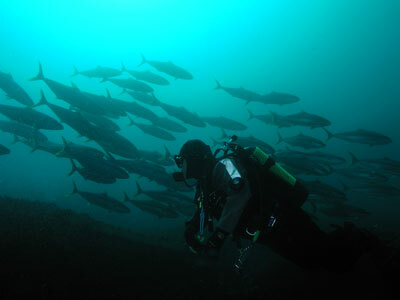 On a dive here in early 2006 I saw more than 10 different species and some of them were almost in plague proportions. Very exciting! 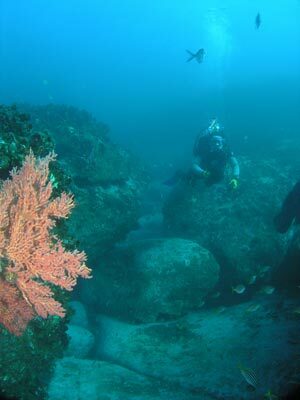 By the time you return to the main reef it should be 12 to 15 minutes into your dive. This should put you near your anchor. On a dive in May 2006 at this spot we had over 50 large yellowtail kingfish circle us for about 4 minutes, coming as close as a metre or so to us. Go back to the 18 to 19 metre depth range and follow this to the south and south-west. As you go you will be following the wall. Your depth will come up to about 17 metres. You will see some small overhangs and a couple of cracks in the wall. From here you can head two ways. If you go to the right (say roughly north), you will come to a gully. If you head straight ahead (west) you will see another wall on your right. This can be followed and after about 10 to 15 metres you will see a notch in the top. Go up and though the notch and you will go over this wall into a very narrow crack. The depth will come up to 8 metres before you drop down into a much larger gully. This is the same gully that you would have encountered if you turned right when exiting The Marble. The depth in the main gully is about 10 to 12 metres and the width is quite variable, being two to five metres wide. The walls of the gully go up to about five metres. See the photograph above. There are some deeper cracks, overhangs and side cracks running off this gully. The is normally prolific fishlife in parts of the gully, including schooling catfish, silver sweep, yellowtail, seapike and ladder-finned pomfrets. You will also see up to a couple of hundred Port Jackson sharks here in the August to September period. At the end of the gully you will come out into an open and deeper area. 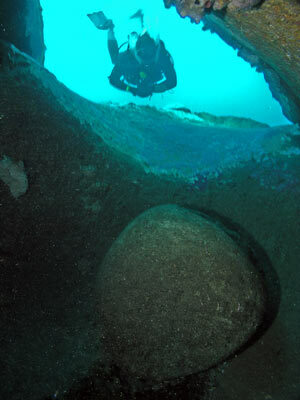 You can keep heading north (it will now be about 35 minutes into the dive) where there are large boulders and many overhangs, small caves and swim-throughs. You can turn right at anytime and head out deeper to the 17 to 19 metre mark and then follow this level to the south to the anchor. An alternative is to turn right and head back out to the 17 to 19 metre depth and go a little north before following this depth back south to the anchor. As mentioned before, the fishlife in some places is very prolific, with thousands of one-spot pullers, girdled parmas, yellowtail and seapike to be seen everywhere. There are also quite a few black reef leatherjackets, six-spined leatherjackets, blue gropers, maori wrasse and other popular fish like luderick. You may even see some very large black drummer and eastern rock blackfish in the gullies. 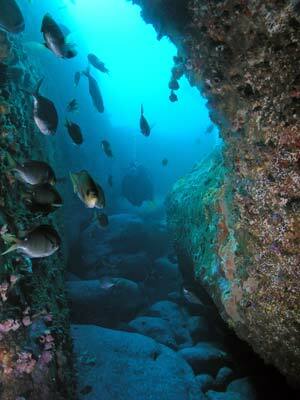 This is an excellent dive location that really lives up to its best known name, Underwater Wilderness. Highly recommended.